Robert McCrum at the British newspaper the Guardian offers a piece on Dashiell Hammett's classic crime novel The Maltese Falcon, which comes in at number 54 in the newspaper's 100 Best Novels series. Raymond Chandler, who has yet to appear in this series, once said: “Hammett is all right. I give him everything. There were a lot of things he could not do, but what he did, he did superbly.” He added, in a summary that helps define Hammett’s achievement: “He was spare, frugal, hard-boiled, but he did over and over again what only the best writers can ever do at all. He wrote scenes that seemed never to have been written before.” He also gave his characters a distinctive language and convincing motivations in a genre that had grown stereotyped, flaccid and uninvolving. 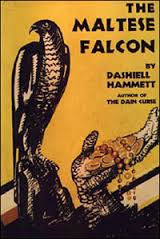 The Maltese Falcon is the Hammett novel that jumps from the pages of its genre and into literature. It’s the book that introduces Sam Spade, the private detective who seduced a generation of readers, leading directly to Philip Marlowe. Dorothy Parker, never a pushover, confessed herself “in a daze of love” such as she had not known in literature “since I encountered Sir Lancelot” and claimed to have read the novel some 30 or 40 times.